Once we have worked with you to create your content marketing strategy, we can help you carry out that strategy with our content marketing services. Here is a listing of the many content marketing services we can implement to help improve your website and put you on a path to meet your content marketing goals. Keeping your website up-to-date with fresh, original content is more important than ever. Your search ranking will drop if your content is stale, and old visitors won’t return if there is nothing new to see. These content marketing services improve search engine optimization, and increase the informational value for your customers and potential customers. Content from your site that is shared will improve your search position, and will greatly increase traffic, leads, and other goals you set for your website. Transforming your visitors into customers, subscribers or leads is called conversion. 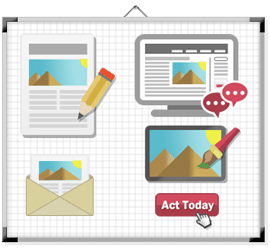 Our conversion-related content marketing services are designed to amplify the results from our traffic related content marketing services. For all your marketing, including online advertising, we can help your you be more effective, generating a greater return on your investment of time and money. We do this not just with one-time actions. We’re there for boosting conversion over time — using performance testing, evaluation, and continuous improvement methods. Ask yourself: does my existing website have content that my audience actually wants to read or view? Does my site have information that potential customers will want to share with friends, family, or co-workers? Does it answer their questions and solve their problems? If not, we can help. We can take your current website and content and re-work it so that the resulting pages significantly improve your visitors’ onsite experience and provide an excellent foundation for additional content. We also other services that while not part of our core content marketing offerings, they can help you meet your marketing goals. For more information about the services we offer to plan your content strategy, please click here.